It has been quite some months since I last blogged and I would have totally forgotten about this little café which I visited sometime in May had it not been for the convenience of digital photography. I couldn't recall how I come to know of this café nor can I remember its name. It is situated along one of those small alleys snaking throughout Tanjong Pagar. The café has its wall lined with bookshelves from floor to ceiling. Some books are free for customers to read while others are wrapped in "sell-only" condition. For those who are not in the reading mood, there is also a variety of good old board games to choose from or even play a game of pool in the courtyard. 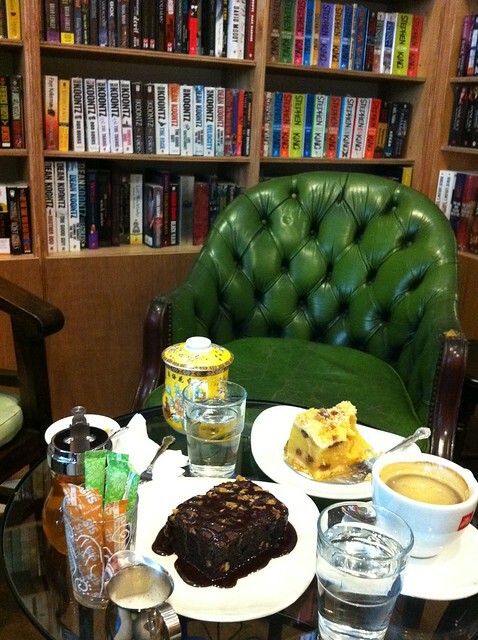 They do not have a wide selection of cakes but the serving is definitely generous! For those who knows the name or address of the café, please do leave a comment here with the details. I do hope to visit the place again some day.